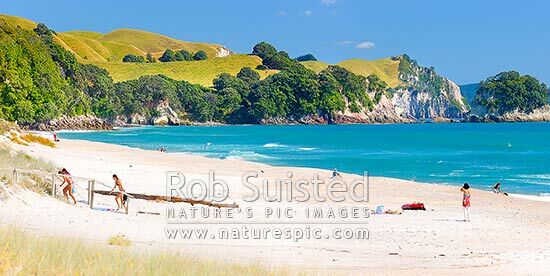 Coromandel Beach at Whiritoa, with people enjoying relaxing, bodyboarding, swimming, surfing, walking and sunbathing in summer warmth. Coromandel Peninsula. Panorama, Whiritoa, Hauraki District, Waikato Region, New Zealand (NZ), stock photo.